Don’t expect the former Navy QB to start — the Seahawks will likely continue to use Tyler Lockett in the slot more to take the bulk of Doug Baldwin’s snaps — but Reynolds could make his NFL debut Monday night at Chicago. Keenan Reynolds couldn’t play last week at Denver, still a member of the Seahawks’ practice squad at the time. But as many practice-squad players do, he made the trip anyway, and as he stood on the field for pregame warmups, a curious thing happened. Suddenly, veteran Denver cornerback Adam “Pacman’’ Jones approached and, as Reynolds said, “dapped me up,’’ giving him a hearty greeting and handshake. The two have never met. But it quickly hit Reynolds. Reynolds laughed as he told the story, which arose from a question about having been mistaken for Baldwin by fans before the game hoping for an autograph. Monday night in Chicago, when the Seahawks play the Bears, Reynolds may be asked to more directly replicate Baldwin, signed to Seattle’s active roster this week with Baldwin likely out a few games with a sprained MCL suffered in the first quarter of the 27-24 loss at Denver. Don’t expect Reynolds to start — the Seahawks will likely continue to use Tyler Lockett in the slot more to take the bulk of Baldwin’s snaps. But Reynolds could well see action in the slot — the position he has primarily played since joining the Seahawks in the spring. And when he does he will achieve not only a lifelong dream but also complete a rather unlikely road from record-setting quarterback at Navy to NFL receiver. Not only is the position switch from quarterback to receiver a tricky one — especially since Reynolds said he never played any position other than quarterback at any time in his football career — but Reynolds also had to receive a rare waiver from the Department of Defense to defer his active duty to instead go into the Ready Reserve so he could pursue a football career (such waivers have since been disallowed). In fact, Reynolds was scheduled for a weekend of reserve duty in Nashville, near his home in Madison, Tenn., this week. But he said he has been able to re-schedule his duties around his football career, planning to set up a schedule that will allow him to perform most of it in the offseason. “They know what the situation is so I will be able to re-schedule that to a different time and be able to do my drills out here,’’ Reynolds said. If being able to immediately pursue a football career was a stroke of good timing, making it as a receiver has mostly been a lot of learning and hard work. Reynolds scored an NCAA record 88 touchdowns as a quarterback in Navy’s triple-option offense and finished fifth in the Heisman Trophy balloting as a senior in 2015. But no NFL teams wanted him as a quarterback. A few initially talked to him about being a running back and he played that position at the 2016 East-West Shrine Game. But by the time of the draft, he knew he’d have to switch to receiver. Reynolds was happy just to get a chance when he was taken in the sixth round by the Baltimore Ravens in 2016. What he wishes now is that he knew what he was in for. He was activated to the 53-man roster for the final game of the 2016 season but didn’t play. Waived before the start of last season, he wasn’t on a roster for two months before Washington signed him to its practice squad in November. Unsigned by Washington at the end of the year he latched on with the Seahawks in May, finally feeling ready to actually compete for a roster spot. “I have put a lot of work in to get to this point and putting it in every day trying to continually improve and make it look like I never played quarterback,’’ he said. 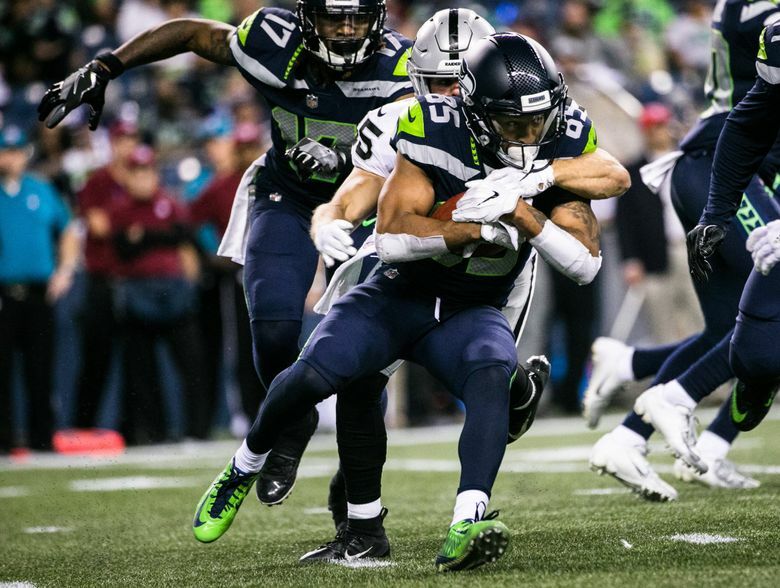 His timing proved fortuitous — if due to unfortunate circumstances for the Seahawks — as Baldwin sat out minicamp with a knee issue and then, after taking part in two practices, was sidelined for the rest of training camp and all four preseason games. “During the offseason, summer and spring, I got all of his targets,’’ said Reynolds who had four catches for 35 yards in the preseason. Meanwhile, he also got the added advantage of learning from Baldwin, who watched almost every practice from the sidelines and offered regular advice. And now to find out if he can not only be mistaken for Baldwin on the field, but play like him, as well.